Please join us this Friday at 7:00PM at Woodbury High School for the District 833 One Act Festival. The cost is $5 for general admission to see all three productions. 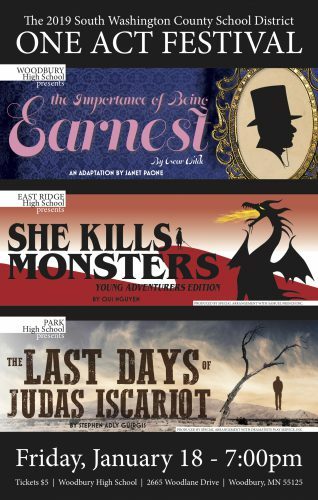 East Ridge’s one act play is She Kills Monsters young adventures edition, a play by Qui Nguyen. Our winter one act play is a contemporary work set in the walls of an average high school (1995 – Athens, Ohio and the imaginary land of New Landia); what’s not so average, is the journey these students embark. After the untimely death of her younger sister Tilly, Agnes has to face, both literally and figuratively, the ghosts of her past through the old avatars of her sister’s Dungeons and Dragons game. It’s only through these battles that Agnes is able to fully gain closure and learn who her sister really was. Below are the one-act performance tech crew. If you’d like to participate in the show but aren’t listed below, please join the production crew in set/props construction or costuming. There is no need to register or pay a fee to be part of the production crew. Dates and times for crew meetings are on the calendar. 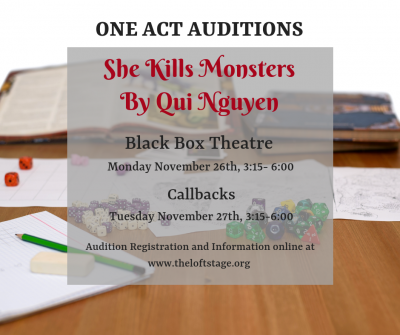 The Loft Stage will hold auditions for our winter one act play, She Kills Monsters, next week! Show Synopsis: After the sudden death of her younger sister Tilly, Agnes finds a notebook belonging to her dead sister that has a module written for the game Dungeons and Dragons. Agnes decides to team up with Tilly’s old party members and play through the game in the hopes of finding who her sister was. Thank you to everyone who made it out to the parent meeting tonight! Here is a link to the slide show with all of the information we went over in the meeting tonight. Thank you to everyone that expressed interest in being part of the performance tech crew for the one-act. As there are a limited number of slots and we need to complete registration by Friday, please find the list of crew members below. Please remember that all performance crew members (minus Alli) must put in at least 20 hours in to set/props construction.